Please feel free to leave any suggestions, requests or comments either here in the forums, or else contact us directly via PM :-) Your input is always appreciated! 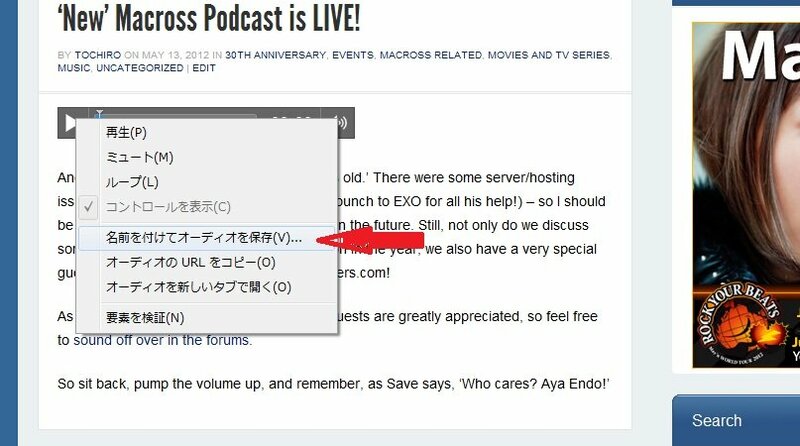 Content is sparse at the moment but we will slowly be adding clips from our Macross lifestyles as time goes on. Eventually, I plan to have the full podcasts up there as well just to give people more options as far as accessing it is concerned. This would be perfect for my morning commute. when I right click on the play button, I get a 'Save audio as' option. Hmm. I don't. Maybe it's the browser? I'm using Firefox. I already downloaded it a few days ago through the Dashboard thanks to admin privileges; maybe something needs to be changed for it to be publicly downloadable? I get the option too and thought it was common knowledge, sorry. Ok, lets get a list going here. So far it appears that the right click to save function is available in Chrome, but not Firefox or IE. EXO, what browser are you using? Given more time I can set up an itunes download link, but it be a while before I have time to get around to it sorry. Aw. Can't we all just get along? I'm using Safari and I don't have the download option, either. Wait we have a pod cast? I hate all pod casts. Radio is dead. I'm bored listing to idiots yaking for hours. I'm pissed at people who have news to tell but gonna hold off and say it on a pod cast first. I'm suppose to listen to the whole thing just to hear someone tell me one tiny little bit of information that is worth while. Could have posted the same news in text form days ago but no we got wait for the podcast. Try fast forwards to the part you might be interested in. It's impossible to find what you want without having to listen to boring people talking. Just some notes about the podcast itself. You might wanna try sectioning off the content and putting a summary of what is where along with the times where each section starts and ends. I also felt that the podcast was a real chore to listen too at certain moments. Your commentary alternated between being fine and sometimes stale. That's partly why I suggested the sectioning. Users like myself would be able to skip around to what they find personally interesting and thus make the whole thing easier to swallow. Don't take them too seriously. Alot of what they say is trolling by their own words. That said I haven't heard what you said about Colony Drop yet. Don't ever listen to the criticism of the mainstream. 9 times out of 10 they are completely hypocritical and full of crap. I really liked Redline myself. The music was great as you said but I didn't have a problem with the romantic elements or the d-boy subplot. It's a fun movie that you really shouldn't take too seriously but if you're so inclined it does have some artistic depth to it beyond the spectacle that is the racing. You guys haven't been watching the Aqualion? That's insane: which also summarizes this show in recent episodes. I hope you have at least watched some of the episodes in the time between recording this podcast and posting it. Here at work, I only have IE and there's no "Save As..." option either. Though, for anyone in my predicament who does want to save it, try right-clicking on this direct link to the podcast. Since it's a 90mb+ file, I'm not going to download it through my job's network and will wait until I get home. You guys haven't been watching the Aqualion? I've been telling them, but at this rate they're never gonna win da aqua lion. I'm still disappointed that the Aqualion isn't a mecha show about underwater mechs. That should happen at some point. Yeah Getter 3 didn't set the best precedent so all we got is Mars Daybreak and Fafnir. I'm enjoying this podcast so far, they pretty much nailed REDLINE on the head for its pros & cons. Good thing is the cons are far outweighed by how awesome the film looks & sounds! P.S. I'm using Google Chrome... no issues. I hate all pod casts. That's why it's a podcast. I'm bored listing to idiots yaking for hours. Don't worry -- we're f*cking JENIUSES. I'm pissed at people who have news to tell but gonna hold off and say it on a pod cast first. No danger of that -- all our casts have been half a year late. I'm suppose to listen to the whole thing just to hear someone tell me one tiny little bit of information that is worth while. Guess again -- none of it is worthwhile. Could have posted the same news in text form days ago but no we got wait for the podcast. Like I said, it was all posted months ago. Literally. Try fast forwards to the part you might be interested in. It's impossible to find what you want without having to listen to boring people talking. Actually... This is a valid point. Some other podcasts give you a time breakdown menu, so you know at what point to fast-forward to. Thanks for all the feedback, people. I'm not in charge of the way it is presented, recorded, formatted, nor uploaded but rest assured that your input is read and taken into consideration. This is the third and longest episode so far -- the reason being that it is actually two episodes in one, just to fit in the Tim Eldred interview. The length is certainly an issue -- this is likely going to be the exception rather than the rule. Also I think from now on we will start sectioning off the cast into three or four different parts to make it more streamlined and reduce the rambling. I believe the "what are you watching now" thing was supposed to be an attempt at that. Mr March, thank you for your points. However, I thought we did introduce ourselves..? I believe that's the first thing we do at the beginning of each episode, introducing our real names and MW handles, although sometimes it might be hard to hear (especially since we don't use the handles in conversation). Roy Focker, I know how you feel. We actually have a specific goal with this, and I personally don't like to do anything that just anybody can do -- I would rather leave it to someone who's better at it. The purpose of this podcast is to open a window into Macross fandom within Japan. I'm not trying to brag or anything, but I think the fact that we are based in Japan and our experiences here give us a unique insight, just as a matter of fact. So we would like to share our experiences with those who are not fortunate enough, say, to attend the Macross Exhibition with the 1/1 Valk, or attend all the really cool concerts, or speak to Kawamori or Tenjin or Ishiguro, etc. Those are experiences that we would like to share with you, like stupid things that we said to Mikimoto, dumb jokes that Chie Kajiura made about Tochiro on Twitter, etc. I don't even remember who first pitched the idea for doing this, but I'm pretty sure it was Tochiro, and his reasons were sound, so I joined. We're trying to give you a sense of how active, organic and actually productive the Macross fan community is at the moment. The best way of doing that we decided would be just to get together and have a chat. We still have a ways to go, and I really hope that things become a bit more streamlined in terms of frequency and length, but hey, we're all doing our part. I'm watching it... But it's really not my kind of thing, so I didn't talk about it. Either that, or I just forgot. I just listened to the first few minutes -- you're right, we didn't introduce our handle names. Huh. That's really odd, we usually do. Sorry about that! No worries and thanks for the fast replies. I look forward to the next episode. Keep up the good work! I'm not into podcasts at all but I really enjoyed this one. Listened to the whole thing in 2 sessions. I also told Tochiro to say the date the podcast is being recorded in the beginning. I wasn't referring to "Seedy" at all, I was pointing my proverbial finger at actual reputable anime news sites. As for Redline, guilty as charged. I think people have me confused with Richard (Gubaba), he mentioned "Seedy". I liked Redline too. Just finished listening to the podcast will try to speak up or move closer to the mic in the future. That's true. It was me. Ill follow, not a huge fan of podcasts, but usually people that like Macross have similar tastes and it makes for interesting listening. I think Macross breeds a different kind of anime fan. I normally don't listen to fan podcasts, but decided to give this one a shot. You guys definitely know your stuff and it was nice to put voices to your screen names. I also liked the group's chemistry. I suppose that has to do with the fact that you all have hung out in person before and that chemistry carried over to the broadcast. And like Renato wrote earlier, being bilingual and living in Japan gives you guys a perspective and credibility that other shows can't match. I was surprised to hear that Tim Eldred was your guest speaker. 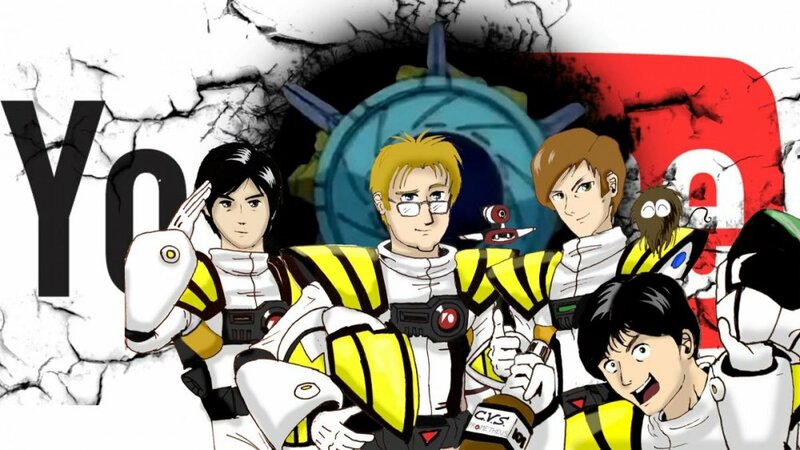 I remember him and Greg Lane as being the only good mecha artists that the old Robotech comics had, so I was pleasantly surprised to hear that Eldred's now a professional storyboarder and works on the Star Blazers' website. I always wondered what happened to him after his days at Eternity. Another thing that I really loved was hearing an intelligent discussion that involved both Macross and Robotech. I'd almost forgotten that that was even possible. Listening to that segment made me realize that one huge advantage that closed podcasts have over messageboards is that dumdums and trolls can't sh!t on the discussion. But, there's always room for improvement. There were times when you guys rambled on and went way off track. I could tell that Tochiro was trying to steer the discussion back on track at times, though I just wish he did it a bit more often. I understand that there's probably a desire to give everyone an opportunity to have their say, but I think it's best for the show's producer (Tochiro?) to take a stronger role in steering the ship. Also, try to make sure everyone speaks directly into their mics. It was a little jarring to hear someone speak at full volume, then another person at almost a whisper. Though overall, job well done. So, uh...when are we doing the next one? I just saw the Nichimo Zentradi stamp kit....good stuff. Will there be a MW video podcast in the future? We arranged the very first MW podcast last year to be filmed, and it was. We had a whole thing set up, and we talked around a large table adorned with Hidetaka Tenjin posters and stuff, and a Microman GunRobo (original black pre-Megatron), which I used to shoot people whose opinions I did not care for. Unfortunately, something happened, I don't know what, and we were left with audio only. I proposed to try again from the second cast onwards, but it didn't happen. Many thanks for all the feedback everyone! One thing that seemed apparent based on some of the feedback I've been getting is that quite a few people didn't realise that this was a new EPISODE of the podcast and not the first episode of a NEW podcast. It's actually episode 3. The links to the first two episodes are useless due to Megaupload being gone, so I'm re-encoding them and will be posting them on MW. I've just put Ep. 1 up and while theres still some technical hiccups (its displaying differently and the scoopbot seems to have latched onto it for some reason) it should be listenable. Get it HERE (also added to the first post of this thread). I'll redo Ep. 2 next weekend, and will be recording the first half of Ep. 4 a week or two after that. To address some of the suggestions that people have put out there, once I have 3-4 eps posted I will get them onto an itunes account. At some point I also hope to have them indexed on a separate page which will also include descriptions and timestamps. In the meantime I will be posting timestamps in this thread from Ep. 4 onwards. I listened to the entire podcast, all 3+ hours. I suppose that generous length is necessitated by the frequency at which you're releasing these podcats (once a month? whenever?). Once a month? Heck I WISH I had that sort of time! Basically the idea is to do it 4-5 times a year during a regular year, with more frequent casts as required - ie, I'm expecting to do a few extra this year due to the 30th Anniversary. Actually, while we omitted forum handle introductions in this episode, we did do them in previous episodes so I didnt think saying them again was necessary at the time. I might just put a name list up with each episode saying who participated and who they are on the forums. We actually have a specific goal with this, and I personally don't like to do anything that just anybody can do -- I would rather leave it to someone who's better at it. The purpose of this podcast is to open a window into Macross fandom within Japan. I'm not trying to brag or anything, but I think the fact that we are based in Japan and our experiences here give us a unique insight, just as a matter of fact. So we would like to share our experiences with those who are not fortunate enough, say, to attend the Macross Exhibition with the 1/1 Valk, or attend all the really cool concerts, or speak to Kawamori or Tenjin or Ishiguro, etc. Those are experiences that we would like to share with you, like stupid things that we said to Mikimoto, dumb jokes that Chie Kajiura made about Tochiro on Twitter, etc..... We're trying to give you a sense of how active, organic and actually productive the Macross fan community is at the moment. I normally don't listen to fan podcasts, but decided to give this one a shot. You guys definitely know your stuff and it was nice to put voices to your screen names. I also liked the group's chemistry. I suppose that has to do with the fact that you all have hung out in person before and that chemistry carried over to the broadcast. ....Also, try to make sure everyone speaks directly into their mics. It was a little jarring to hear someone speak at full volume, then another person at almost a whisper. Though overall, job well done. Many thanks for the kind words! For something like this, I feel that getting everyone in the same room (preferably with alcohol) is key - there are far too many podcasts out there where it's one long skype conversation and theres no chance for people to really play off each other. As for the volume issues - its a difficult problem to solve because we only have one mic (albeit a decent one) so people's voices are naturally going to sound different depending on how far from/close to the mic they are. Thats why we cram as many ppl as possible onto the couch because that puts them directly in front of the mic. I just saw the Nichimo Zentradi stamp kit....good stuff. Will there be a MW video podcast in the future? Sorry but a vidcast isnt in the cards at the moment because such an undertaking would require everyone to wear pants. It's ok as long as Renato is wearing his best socks.